Harbor on Beautiful Tawas Bay! Visitors to the Tawas area will find a safe - and breathtakingly beautiful - harbor at the East Tawas State Dock. 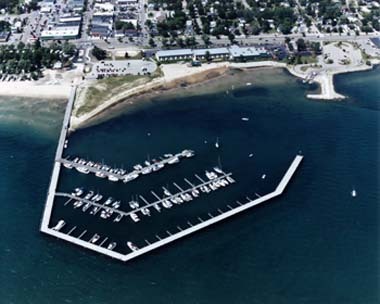 The 140-slip marina (60 seasonal and 80 transient slips) is located on Tawas Bay. Amenities include a boat launch, new toilet/shower building, dock office, playground/park, water, electricity, garbage pick-up, and recycling. There's also a swimming beach just south of the dock. But the State Dock is more than just a marina - it has become a gathering point for local festivals and events. Its convenient and scenic location at the foot of the Newman Street Shopping District in East Tawas, is a natural draw for visitors. Amenities include: water, electricity (30- and 20-amp service), restrooms, showers, gasoline, diesel, pump-out, boat launch, pay phone, day-use dockage and playground/park. MiWiFi, wireless Internet service, available for a fee.